New PREPARE Study in JAMA Internal Medicine! In exciting news–the results of our PREPARE randomized trial among nearly 1,000 English and Spanish speaking older adults from a public hospital was just published in JAMA Internal Medicine. 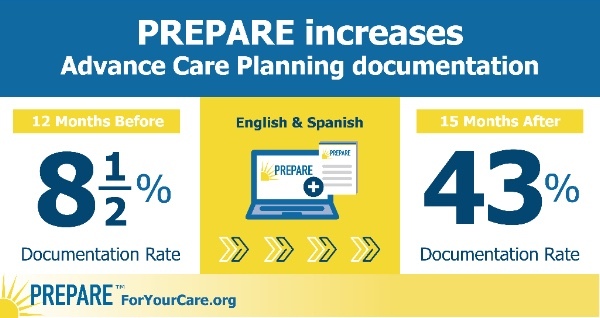 After reviewing the PREPARE For Your Care online program and the easy-to-read advance directive, 98% of older adults reported increased engagement in advance care planning (ACP) and 43% had new ACP documentation in their medical record. These easy-to-use, patient-centered materials worked equally well among English and Spanish-speakers and across health literacy levels. Click here for the press release and links to podcasts.